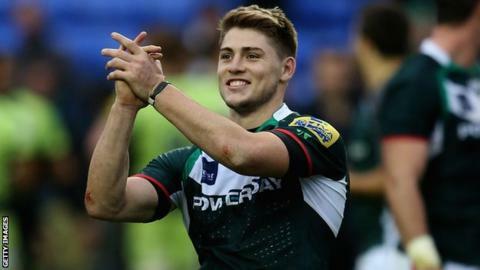 London Irish have confirmed James O'Connor only suffered a hamstring strain on Sunday and are confident he will return before the season ends. The full-back will miss this weekend's trip to Northampton but the Exiles expect the Australian to return for the match at Gloucester on 3 May. He will join Toulon in France at the end of the season while the Exiles themselves have three matches left. They end their season on 10 May at home to Sale Sharks. O'Connor, 23, joined the Premiership club in October after the Australian Rugby Union terminated his contract following a string of off-field incidents. However, after a successful stint with London Irish he will play in France for part of next season before a likely spell in Super 14 as he looks to win back his international place before the 2015 World Cup. Meanwhile, Exiles director of rugby Brian Smith praised his side's "doggedness, character and grit" after they scored six tries in defeating Newcastle. "The six tries was great to see," he told BBC Radio Berkshire. "I preferred the second-half performance because we did not concede a point. I quite enjoyed that we were put under the pump for 40 minutes but did not concede anything."